For the African philosophy, see Ubuntu philosophy. For other uses, see Ubuntu (disambiguation). Ubuntu (/ʊˈbʊntuː/ ( listen)) is a free and open-source Linux distribution based on Debian. Ubuntu is officially released in three editions: Desktop, Server, and Core (for internet of things devices and robots). Ubuntu is a popular operating system for cloud computing, with support for OpenStack. Ubuntu is released every six months, with long-term support (LTS) releases every two years. The latest release is 19.04 ("Disco Dingo"), and the most recent long-term support release is 18.04 LTS ("Bionic Beaver"), which is supported until 2028. Ubuntu is named after the African philosophy of ubuntu, which Canonical translates as "humanity to others" or "I am what I am because of who we all are". Ubuntu is built on Debian's architecture and infrastructure, and comprises Linux server, desktop and discontinued phone and tablet operating system versions. Ubuntu releases updated versions predictably every six months, and each release receives free support for nine months (eighteen months prior to 13.04) with security fixes, high-impact bug fixes and conservative, substantially beneficial low-risk bug fixes. The first release was in October 2004. Current long-term support (LTS) releases are supported for five years, and are released every two years. LTS releases get regular point releases with support for new hardware and integration of all the updates published in that series to date. Ubuntu packages are based on packages from Debian's unstable branch. Both distributions use Debian's deb package format and package management tools (e.g. APT and Ubuntu Software). Debian and Ubuntu packages are not necessarily binary compatible with each other, however, so packages may need to be rebuilt from source to be used in Ubuntu. Many Ubuntu developers are also maintainers of key packages within Debian. Ubuntu cooperates with Debian by pushing changes back to Debian, although there has been criticism that this does not happen often enough. Ian Murdock, the founder of Debian, had expressed concern about Ubuntu packages potentially diverging too far from Debian to remain compatible. Before release, packages are imported from Debian unstable continuously and merged with Ubuntu-specific modifications. One month before release, imports are frozen, and packagers then work to ensure that the frozen features interoperate well together. Ubuntu is currently funded by Canonical Ltd. On 8 July 2005, Mark Shuttleworth and Canonical announced the creation of the Ubuntu Foundation and provided an initial funding of US$10 million. The purpose of the foundation is to ensure the support and development for all future versions of Ubuntu. Mark Shuttleworth describes the foundation goal as to ensure the continuity of the Ubuntu project. On 12 March 2009, Ubuntu announced developer support for third-party cloud management platforms, such as those used at Amazon EC2. GNOME 3 has been the default GUI for Ubuntu Desktop since Ubuntu 17.10, while Unity is still the default in older versions, including all current LTS versions except 18.04 LTS. However, a community-driven fork of Unity 8, called Yunit, has been created to continue the development of Unity. [non-primary source needed] Shuttleworth wrote on 8 April 2017, "We will invest in Ubuntu GNOME with the intent of delivering a fantastic all-GNOME desktop. We're helping the Ubuntu GNOME team, not creating something different or competitive with that effort. While I am passionate about the design ideas in Unity, and hope GNOME may be more open to them now, I think we should respect the GNOME design leadership by delivering GNOME the way GNOME wants it delivered. Our role in that, as usual, will be to make sure that upgrades, integration, security, performance and the full experience are fantastic." Shuttleworth also mentioned that Canonical will cease development for Ubuntu Phone, Tablet, and convergence. 32-bit i386 processors have been supported up to Ubuntu 18.04, but users "will not be allowed to upgrade to Ubuntu 18.10 as dropping support for that architecture is being evaluated". A default installation of Ubuntu contains a wide range of software that includes LibreOffice, Firefox, Thunderbird, Transmission, and several lightweight games such as Sudoku and chess. Many additional software packages are accessible from the built in Ubuntu Software (previously Ubuntu Software Center) as well as any other APT-based package management tools. Many additional software packages that are no longer installed by default, such as Evolution, GIMP, Pidgin, and Synaptic, are still accessible in the repositories still installable by the main tool or by any other APT-based package management tool. Cross-distribution snap packages and flatpaks are also available, that both allow installing software, such as some of Microsoft's software, in most of the major Linux operating systems (such as any currently supported Ubuntu version and in Fedora). The default file manager is GNOME Files, formerly called Nautilus. Ubuntu aims to be secure by default. User programs run with low privileges and cannot corrupt the operating system or other users' files. For increased security, the sudo tool is used to assign temporary privileges for performing administrative tasks, which allows the root account to remain locked and helps prevent inexperienced users from inadvertently making catastrophic system changes or opening security holes. Polkit is also being widely implemented into the desktop. Most network ports are closed by default to prevent hacking. A built-in firewall allows end-users who install network servers to control access. A GUI (GUI for Uncomplicated Firewall) is available to configure it. Ubuntu compiles its packages using GCC features such as PIE and buffer overflow protection to harden its software. These extra features greatly increase security at the performance expense of 1% in 32-bit and 0.01% in 64-bit. Ubuntu also supports full disk encryption as well as encryption of the home and Private directories. The system requirements vary among Ubuntu products. For the Ubuntu desktop release 16.04 LTS, a PC with at least 2 GHz dual-core processor, 2 GB of RAM and 25 GB of free disk space is recommended. For less powerful computers, there are other Ubuntu distributions such as Lubuntu and Xubuntu. Ubuntu supports the ARM architecture. It is also available on Power ISA, while older PowerPC architecture was at one point unofficially supported, and now newer Power ISA CPUs (POWER8) are supported. Live images are the typical way for users to assess and subsequently install Ubuntu. These can be downloaded as a disk image (.iso) and subsequently burnt to a DVD and booted, or run via UNetbootin directly from a USB drive (making, respectively, a live DVD or live USB medium). Running Ubuntu in this way is slower than running it from a hard drive, but does not alter the computer unless specifically instructed by the user. If the user chooses to boot the live image rather than execute an installer at boot time, there is still the option to then use an installer called Ubiquity to install Ubuntu once booted into the live environment. Disk images of all current and past versions are available for download at the Ubuntu web site. Various third-party programs such as remastersys and Reconstructor are available to create customized copies of the Ubuntu Live DVDs (or CDs). "Minimal CDs" are available (for server use) that fit on a CD. Additionally, USB flash drive installations can be used to boot Ubuntu and Kubuntu in a way that allows permanent saving of user settings and portability of the USB-installed system between physical machines (however, the computers' BIOS must support booting from USB). In newer versions of Ubuntu, the Ubuntu Live USB creator can be used to install Ubuntu on a USB drive (with or without a live CD or DVD). Creating a bootable USB drive with persistence is as simple as dragging a slider to determine how much space to reserve for persistence; for this, Ubuntu employs casper. The desktop edition can also be installed using the Netboot image (a.k.a. netboot tarball) which uses the debian-installer and allows certain specialist installations of Ubuntu: setting up automated deployments, upgrading from older installations without network access, LVM or RAID partitioning, installs on systems with less than about 256 MB of RAM (although low-memory systems may not be able to run a full desktop environment reasonably). Ubuntu divides most software into four domains to reflect differences in licensing and the degree of support available. Some unsupported applications receive updates from community members, but not from Canonical Ltd.
Free software includes software that has met the Ubuntu licensing requirements, which roughly correspond to the Debian Free Software Guidelines. Exceptions, however, include firmware, in the Main category, because although some firmware is not allowed to be modified, their distribution is still permitted. Non-free software is usually unsupported (Multiverse), but some exceptions (Restricted) are made for important non-free software. Supported non-free software includes device drivers that can be used to run Ubuntu on some current hardware, such as binary-only graphics card drivers. The level of support in the Restricted category is more limited than that of Main, because the developers may not have access to the source code. It is intended that Main and Restricted should contain all software needed for a complete desktop environment. Alternative programs for the same tasks and programs for specialized applications are placed in the Universe and Multiverse categories. In addition to the above, in which the software does not receive new features after an initial release, Ubuntu Backports is an officially recognized repository for backporting newer software from later versions of Ubuntu. The repository is not comprehensive; it consists primarily of user-requested packages, which are approved if they meet quality guidelines. Backports receives no support at all from Canonical, and is entirely community-maintained. The -updates repository provides stable release updates (SRU) of Ubuntu and are generally installed through update-manager. Each release is given its own -updates repository (e.g. intrepid-updates). The repository is supported by Canonical Ltd. for packages in main and restricted, and by the community for packages in universe and multiverse. All updates to the repository must meet certain requirements and go through the -proposed repository before being made available to the public. Updates are scheduled to be available until the end of life for the release. In addition to the -updates repository, the unstable -proposed repository contains uploads which must be confirmed before being copied into -updates. All updates must go through this process to ensure that the patch does truly fix the bug and there is no risk of regression. Updates in -proposed are confirmed by either Canonical or members of the community. Canonical's partner repository lets vendors of proprietary software deliver their products to Ubuntu users at no cost through the same familiar tools for installing and upgrading software. The software in the partner repository is officially supported with security and other important updates by its respective vendors. Canonical supports the packaging of the software for Ubuntu and provides guidance to vendors. The partner repository is disabled by default and can be enabled by the user. Some popular products distributed via the partner repository as of 28 April 2013[update] are Adobe Flash Player, Adobe Reader, Skype and Wine are also able to be installed to run Windows software if the user desires. A Personal Package Archive (PPA) is a software repository for uploading source packages to be built and published as an Advanced Packaging Tool (APT) repository by Launchpad. While the term is used exclusively within Ubuntu, Launchpad's host, Canonical, envisions adoption beyond the Ubuntu community. Ubuntu has a certification system for third-party software. Some third-party software that does not limit distribution is included in Ubuntu's multiverse component. The package ubuntu-restricted-extras additionally contains software that may be legally restricted, including support for MP3 and DVD playback, Microsoft TrueType core fonts, Sun's Java runtime environment, Adobe's Flash Player plugin, many common audio/video codecs, and unrar, an unarchiver for files compressed in the RAR file format. Additionally, third-party application suites are available for purchase through Ubuntu Software, including many games such as Braid and Oil Rush, software for DVD playback and media codecs. More games are available through Steam. For further information on all Ubuntu releases including older ones not covered here, see Ubuntu version history. Each Ubuntu release has a version number that consists of the year and month number of the release. For example, the first release was Ubuntu 4.10 as it was released on 20 October 2004. Version numbers for future versions are provisional; if the release is delayed the version number changes accordingly. Ubuntu releases are also given alliterative code names, using an adjective and an animal (e.g. "Xenial Xerus"). With the exception of the first two releases, code names are in alphabetical order, allowing a quick determination of which release is newer, at least until restarting the cycle with the release of Artful Aardvark in October 2017. Commonly, Ubuntu releases are referred to using only the adjective portion of the code name; for example, the 14.04 LTS release is commonly known as "Trusty". Releases are timed to be approximately one month after GNOME releases (which in turn are about one month after releases of X.org). As a result, every Ubuntu release was introduced with an updated version of both GNOME and X. After major releases, the Ubuntu Developer Summit (UDS) is held, at which the Ubuntu community sets the development direction for the next cycle. The latest such event, as of February 2017,[update] was held 5–7 May 2015, after Ubuntu 15.04 and planning 15.10. Upgrades from one LTS release to the next LTS release (e.g. Ubuntu 14.04 LTS to Ubuntu 16.04 LTS and then to Ubuntu 18.04 LTS) are supported, while upgrades from non-LTS have only supported upgrade to the next release, regardless of its LTS status (e.g. Ubuntu 15.10 to Ubuntu 16.04 LTS). Ubuntu 10.10 (Maverick Meerkat), was released on 10 October 2010 (10–10–10). This departed from the traditional schedule of releasing at the end of October in order to get "the perfect 10", and makes a playful reference to The Hitchhiker's Guide to the Galaxy books, since, in binary, 101010 equals decimal 42, the "Answer to the Ultimate Question of Life, the Universe and Everything" within the series. Ubuntu (16.04.5 and later) requires a 2 GB or larger installation medium. However, there is an option to install it with a Minimal CD. Ubuntu Desktop (formally named as Ubuntu Desktop Edition, and simply called Ubuntu) is the variant officially recommended for most users. It is designed for desktop and laptop PCs and officially supported by Canonical. From Ubuntu 17.10, GNOME Shell is the default desktop environment. From Ubuntu 11.04 to Ubuntu 17.04, the Unity desktop interface was default, and before Ubuntu 11.04 the desktop interface was GNOME 2. A number of other variants are distinguished simply by each featuring a different desktop environment. LXQt and Xfce are often recommended for use with older PCs that may have less memory and processing power available. These Ubuntu variants simply install a set of packages different from the original Ubuntu, but since they draw additional packages and updates from the same repositories as Ubuntu, all of the same software is available for each of them. Edubuntu A complete Linux based operating system targeted for primary and secondary education. It is freely available with community based support. The Edubuntu community is built on the ideas enshrined in the Edubuntu Manifesto: that software, especially for education, should be available free of charge and that software tools should be usable by people in their local language and despite any disabilities. Kubuntu An official derivative of Ubuntu Linux using KDE instead of the GNOME or Unity interfaces used by default in Ubuntu. Lubuntu Lubuntu is a project that is an official derivative of the Ubuntu operating system that is "lighter, less resource hungry and more energy-efficient", using the LXQt desktop environment (used LXDE before 18.10). Ubuntu Budgie An official derivative of Ubuntu using Budgie. Ubuntu Kylin An official derivative aimed at the Chinese market. Ubuntu MATE An official derivative of Ubuntu using MATE, a desktop environment forked from the now-defunct GNOME 2 code base, with an emphasis on the desktop metaphor. Ubuntu Server Ubuntu has a server edition that uses the same APT repositories as the Ubuntu Desktop Edition. The differences between them are the absence of an X Window environment in a default installation of the server edition (although one can easily be installed, including Unity, GNOME, KDE or Xfce), and some alterations to the installation process. The server edition uses a screen-mode, character-based interface for the installation, instead of a graphical installation process. This enables installation on machines with a serial or "dumb terminal" interface without graphics support. Since version 10.10, the server edition (like the desktop version) supports hardware virtualization and can be run in a virtual machine, either inside a host operating system or in a hypervisor, such as VMware ESXi, Oracle, Citrix XenServer, Microsoft Hyper-V, QEMU, a Kernel-based Virtual Machine, or any other IBM PC compatible emulator or virtualizer. Ubuntu 7.10 and later turn on the AppArmor security module for the Linux kernel by default on key software packages, and the firewall is extended to common services used by the operating system. Has minimum requirements of: 512 MB RAM, 1 GHz CPU, and 1 GB disk space (1.75 GB for all features to be installed). Runs on all major architectures – x86, x86-64, ARM v7, ARM64, POWER8 and IBM System z mainframes via LinuxONE. SPARC is no longer commercially supported. Supports ZFS, a file system with snapshot capabilities, since Ubuntu 16.04 LTS. Has LXD, a hypervisor to manage LXC Linux containers. Includes the first production release of DPDK for line-speed kernel networking. Uses Linux 4.4 kernel and systemd service manager. Is certified as a guest on AWS, Microsoft Azure, Joyent, IBM and HP Cloud. It has up-to-date versions of key server software pre-installed, including: Tomcat (v8), PostgreSQL (v9.5), Docker v(1.10), Puppet (v3.8.5), Qemu (v2.5), Libvirt (v1.3.1), LXC (v2.0), and MySQL (v5.6). Ubuntu Studio Based on Ubuntu, providing open-source applications for multimedia creation aimed at the audio, video and graphic editors. Xubuntu An official derivative of Ubuntu using Xfce. Xubuntu is intended for use on less-powerful computers or those who seek a highly efficient desktop environment on faster systems, and uses mostly GTK+ applications. Gobuntu Gobuntu was an official derivative of the Ubuntu operating system, aiming to provide a distribution consisting entirely of free software. It was officially announced by Mark Shuttleworth on July 10, 2007, and daily builds of Gobuntu 7.10 began to be publicly released. The project ended around the release of 8.04 and has since merged into mainline Ubuntu as a "free software" option. Mythbuntu Based on Ubuntu and MythTV, providing applications for recording TV and acting as a media centre. On 4 November 2016, the development team announced the end of Mythbuntu as a separate distribution, citing insufficient developers. Ubuntu for Android Designed for use with Android phones. No longer under active development. Ubuntu GNOME Formerly an official Ubuntu variant, but since 17.10, which uses Gnome Shell as its default desktop and GDM as its display manager, this has been merged into mainline releases. Ubuntu JeOS "Just Enough OS" – was described as "an efficient variant ... configured specifically for virtual appliances". Since the release of Ubuntu 8.10 it has been included as an option as part of the standard Ubuntu Server Edition. Ubuntu Mobile An embedded operating system designed for use on mobile devices. The operating system will use Hildon from maemo as its graphical frontend. Ubuntu Touch is a successor to Ubuntu Mobile. Ubuntu Netbook Edition Netbook Edition was an official derivative of Ubuntu designed for netbooks using the Intel Atom processor. Starting from Ubuntu 11.04, Ubuntu Netbook Edition has been merged into the desktop edition. Ubuntu Touch Designed for use with touchscreen devices. Ubuntu TV Designed for use with TVs. Ubuntu offers Ubuntu Cloud Images which are pre-installed disk images that have been customized by Ubuntu engineering to run on cloud-platforms such as Amazon EC2, OpenStack, Microsoft Azure and LXC. Ubuntu is also prevalent on VPS platforms such as DigitalOcean. Ubuntu 11.04 added support for OpenStack, with Eucalyptus to OpenStack migration tools added by Canonical in Ubuntu Server 11.10. Ubuntu 11.10 added focus on OpenStack as the Ubuntu's preferred IaaS offering though Eucalyptus is also supported. Another major focus is Canonical Juju for provisioning, deploying, hosting, managing, and orchestrating enterprise data center infrastructure services, by, with, and for the Ubuntu Server. As Ubuntu is distributed freely and there is no registration process, Ubuntu usage can only be roughly estimated. In 2015, Canonical's Ubuntu Insights page stated "Ubuntu now has over 40 million desktop users and counting". Ubuntu is the most popular Linux distribution for running Web servers, used by 34% of "all the websites" they analyze. Linux distributions are used a little more than Microsoft Windows for websites based on W3Techs numbers, and only Ubuntu and Debian (which Ubuntu is based on, with the same package manager and thus administered the same way) make up 65% of all Linux distributions for web serving use; the usage of Ubuntu surpassed Debian (for such server use), in May 2016. Ubuntu is used by 12.4% of all websites analyzed, growing from less than 7% in October 2012. W3Techs analyzes the top 10 million websites only. It considers Linux a subcategory of Unix and estimated in the same month that 66.7% of the analyzed websites use Unix, under that broad definition. According to TheCloudMarket.com, Ubuntu is on at least 57% of the images it scanned on Amazon EC2 (and Windows at 7.8%). Wikimedia Foundation data (based on user agent) for September 2013 shows that Ubuntu generated the most page requests to Wikimedia sites, including Wikipedia, among recognizable Linux distributions. The public sector has also adopted Ubuntu. As of January 2009[update], the Ministry of Education and Science of the Republic of Macedonia deployed more than 180,000 Ubuntu-based classroom desktops, and has encouraged every student in the country to use Ubuntu-powered computer workstations; the Spanish school system has 195,000 Ubuntu desktops. The French police, having already started using open-source software in 2005 by replacing Microsoft Office with OpenOffice.org, decided to transition to Ubuntu from Windows XP after the release of Windows Vista in 2006. By March 2009, the Gendarmerie Nationale had already switched 5000 workstations to Ubuntu. Based on the success of that transition, it planned to switch 15,000 more over by the end of 2009 and to have switched all 90,000 workstations over by 2015 (GendBuntu project). Lt. Colonel Guimard announced that the move was very easy and allowed for a 70% saving on the IT budget without having to reduce its capabilities. In 2011, Ubuntu 10.04 was adopted by the Indian justice system. The Government of Kerala adopted Ubuntu for the legislators in Kerala and the government schools of Kerala began to use customized IT@School Project Ubuntu 10.04 which contains specially created software for students. Previously, Windows was used in the schools. Textbooks were also remade with an Ubuntu syllabus and are currently used in schools. The city of Munich, Germany, forked Kubuntu 10.04 LTS and created LiMux for use on the city's computers. After originally planning to migrate 12,000 desktop computers to LiMux, it was announced in December 2013 that the project had completed successfully with the migration of 14,800 out of 15,500 desktop computers, but still keeping about 5000 Windows clients for unported applications. In February 2017 the city decided to evaluate the migration back to Windows – some stated reasons were missing compatibility, bad user acceptance and complexity. In March 2012, the government of Iceland launched a project to get all public institutions using free and open-source software. Already, several government agencies and schools have adopted Ubuntu. The government cited cost savings as a big factor for the decision, and also stated that open-source software avoids vendor lock-in. A 12-month project was launched to migrate the biggest public institutions in Iceland to using open-source software, and help ease the migration for others. US president Barack Obama's successful campaign for re-election in 2012 used Ubuntu in its IT department. In August 2014, the city of Turin, Italy, announced its migration from Windows XP to Ubuntu for the 8,300 desktop computers used by the municipality, becoming the first city in Italy to adopt Ubuntu. Ubuntu was awarded the Reader Award for best Linux distribution at the 2005 LinuxWorld Conference and Expo in London, received favorable reviews in online and print publications, and has won InfoWorld's 2007 Bossie Award for Best Open Source Client OS. In early 2008, PC World named Ubuntu the "best all-around Linux distribution available today", though it criticized the lack of an integrated desktop effects manager. Chris DiBona, the program manager for open-source software at Google, said "I think Ubuntu has captured people's imaginations around the Linux desktop," and "If there is a hope for the Linux desktop, it would be them". As of January 2009[update], almost half of Google's 20,000 employees used Goobuntu, a slightly modified version of Ubuntu. In 2012, ZDNet reported that Ubuntu was still Google's desktop of choice. In March 2016, Matt Hartley picked a list of best Linux distributions for Datamation; he chose Ubuntu as number one. In 2008, Jamie Hyneman, co-host of the American television series MythBusters, advocated Linux (giving the example of Ubuntu) as a solution to software bloat. Other celebrity users of Ubuntu include science fiction writer Cory Doctorow and actor Stephen Fry. In January 2014, the UK's authority for computer security, CESG, reported that Ubuntu 12.04 LTS was "the only operating system that passes as many as 9 out of 12 requirements without any significant risks". Ubuntu 14.04 improved battery life, but still lagged other operating systems in the battery life metric. One of the new features of Unity in Ubuntu 12.10 was the shopping lens—Amazon search results displayed in the Unity dash. It was alternately described as the "Amazon controversy", "privacy fiasco" and "spyware". From October 2012, it sent the user's queries through a secure HTTPS connection from the home lens to productsearch.ubuntu.com, which then polled Amazon.com to find relevant products; Amazon then sent product images directly to the user's computer through HTTP. If the user clicked on one of these results and then bought something, Canonical received a small commission on the sale. In 2012, many reviewers criticized it: as the home lens is the normal means to search for content on the local machine, reviewers were concerned about the disclosure of queries that were intended to be local, creating a privacy problem. As the feature is active by default instead of opt-in, many users could be unaware of it. Some users chose to turn it off or to remove the feature using a patch. An April 2014 article by Scott Gilbertson stated that the online search components of Ubuntu could be turned off with a couple of clicks in version 14.04. For the move, it was awarded the 2013 Austria Big Brother Award. Since Ubuntu 16.04, the setting has been off by default. The Unity desktop environment was discontinued in Ubuntu 17.10, in favour of GNOME, which has no support for Unity lenses. An Amazon shopping icon still appears in the Ubuntu Dock by default, but merely opens the default web browser with Canonical's referral link. Soon after being introduced, doubts emerged on the conformance of the shopping lens with the European Data Protection Directive. A petition was later signed by over 50 Ubuntu users and delivered to Canonical demanding various modifications to the feature in order to clearly frame it within European law. [self-published source?] Canonical did not reply. Not to be confused with Linux User Group. In an effort to reach out to users who are less technical, and to foster a sense of community around the distribution, Local Communities, better known as "LoCos", have been established throughout the world. Originally, each country had one LoCo Team. However, in some areas, most notably the United States and Canada, each state or province may establish a team. A LoCo Council approves teams based upon their efforts to aid in either the development or the promotion of Ubuntu. Ubuntu works closely with OEMs to jointly make Ubuntu available on a wide range of devices. A number of vendors offer computers with Ubuntu pre-installed, including Dell, Hasee, Sharp Corporation, and Cirrus7. Specifically, Dell offers the XPS 13 laptop, Developer Edition with Ubuntu pre-installed. Together, Dell, Lenovo, HP, and Acer offer over 200 desktop and over 400 laptop PCs preloaded with Ubuntu. System76 PCs are also sold with Ubuntu. Dell and System76 customers are able to choose between 30-day, three-month, and yearly Ubuntu support plans through Canonical. Dell computers (running Ubuntu 10.04) include extra support for ATI/AMD Video Graphics, Dell Wireless, Fingerprint Readers, HDMI, Bluetooth, DVD playback (using LinDVD), and MP3/WMA/WMV. Asus is also selling some Eee PCs with Ubuntu pre-installed and announced "many more" models running Ubuntu for 2011. Vodafone has made available a notebook for the South-African market called "Webbook". Dell sells computers (initially Inspiron 14R and 15R laptops) pre-loaded with Ubuntu in India and China, with 850 and 350 retail outlets respectively. Starting in 2013, Alienware began offering its X51 model gaming desktop pre-installed with Ubuntu at a lower price than if it were pre-installed with Windows. 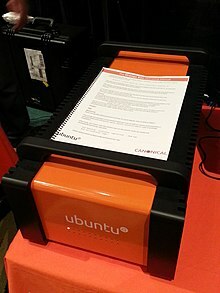 While Linux already works in IBM's mainframe system (zLinux), IBM in collaboration with Canonical (and SUSE; "Linux Foundation will form a new Open Mainframe Project") announced Ubuntu support for their z/Architecture (IBM claims their latest system, IBM zEnterprise System, version z13 is[when?] the most powerful computer in the world; it is[when?] the largest computer by transistor count) for the first time, at the time of their "biggest code drop" ("LinuxOne") in Linux history. In early 2015, Intel launched the Intel Compute Stick small form factor computer available preloaded with Ubuntu or Windows operating systems. In March 2016, Microsoft announced that it would support the Ubuntu userland on top of the Windows 10 kernel by implementing the Linux system calls as a subsystem. It focuses on command-line tools like Bash and is therefore aimed at programmers. As of the Fall Creators Update, this feature is fully available to the public. 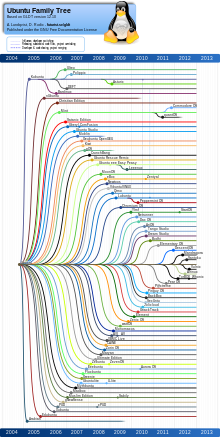 As of 2019, other Linux variants are also supported. ^ "Index of /ubuntu". archive.ubuntu.com. ^ "Explaining Why We Don't Endorse Other Systems". Free Software Foundation. Retrieved 14 July 2015. ^ a b c d e Canonical. "About the Ubuntu project". www.ubuntu.com. Retrieved 1 May 2018. ^ Canonical. "Our mission". www.ubuntu.com. Retrieved 1 May 2018. ^ Canonical. "Licensing". www.ubuntu.com. Retrieved 1 May 2018. ^ Canonical. "Debian". www.ubuntu.com. Retrieved 1 May 2018. ^ Canonical. "Ubuntu PC operating system". www.ubuntu.com. Retrieved 1 May 2018. ^ Canonical. "Ubuntu Server - for scale out workloads". www.ubuntu.com. Retrieved 1 May 2018. ^ Canonical. "Ubuntu Core". www.ubuntu.com. Retrieved 1 May 2018. ^ Canonical. "Ubuntu for the Internet of Things". www.ubuntu.com. Retrieved 1 May 2018. ^ Canonical. "OpenStack on Ubuntu is your scalable private cloud, by Canonical". www.ubuntu.com. Retrieved 1 May 2018. ^ "Releases - Ubuntu Wiki". wiki.ubuntu.com. Retrieved 1 May 2018. ^ "LTS - Ubuntu Wiki". wiki.ubuntu.com. Retrieved 1 May 2018. ^ a b Kerner, Sean Michael (15 November 2018). "Canonical Extends Ubuntu 18.04 LTS Linux Support to 10 Years". www.serverwatch.com. Retrieved 16 November 2018. ^ Canonical. "Canonical and Ubuntu". www.ubuntu.com. Retrieved 1 May 2018. ^ Canonical. "Governance". www.ubuntu.com. Retrieved 1 May 2018. ^ Canonical. "Release end of life". www.ubuntu.com. Retrieved 1 May 2018. ^ Canonical. "Support and management". www.ubuntu.com. Retrieved 1 May 2018. ^ Canonical. "Plans and pricing". www.ubuntu.com. Retrieved 1 May 2018. ^ "Ubuntu and Debian". Ubuntu.com. Canonical Ltd. Retrieved 14 December 2013. ^ "About Ubuntu. The Ubuntu Story". Ubuntu.com. Canonical Ltd. Retrieved 21 August 2012. ^ Sneddon, Joey-Elijah (20 March 2013). "Ubuntu To Halve Support Window for 'Regular' Releases". OMG! Ubuntu!. Ohso Ltd. Retrieved 15 May 2013. ^ "Time Based Releases". Ubuntu Wiki. Canonical Ltd. Retrieved 24 October 2013. ^ "Ubuntu 12.04 to feature extended support period for desktop users". Fridge.Ubuntu.com. Canonical Ltd. Retrieved 1 November 2013. ^ Paul, Ryan (28 May 2012). "Precision and purpose: Ubuntu 12.04 and the Unity HUD reviewed". Ars Technica. Retrieved 1 November 2013. ^ "Releases". Ubuntu Wiki. Canonical Ltd. Retrieved 24 October 2013. ^ Shuttleworth, Mark (12 May 2008). "The Art of Release". MarkShuttleworth.com. Retrieved 24 October 2013. ^ Shuttleworth, Mark. "FAQs: Why and Whither for Ubuntu? What about binary compatibility between distributions?". Ubuntu Wiki. Canonical Ltd. Retrieved 4 February 2011. ^ "Website does not reference Debian visibly". Ubuntu Website Bug Tracking [Obsolete]. Canonical Group. Retrieved 31 August 2010 – via Launchpad. ^ "Ubuntu vs. Debian, reprise". 20 April 2005. Archived from the original on 19 August 2014. Retrieved 21 October 2007. ^ Hill, Benjamin Mako (8 July 2005). "Announcing Launch of ($10 m) Ubuntu Foundation". Retrieved 19 August 2008. ^ "RightScale Adds Full Support for Ubuntu Server to Its Cloud Management Platform". Canonical Ltd. 12 March 2009. Archived from the original on 30 January 2011. Retrieved 4 February 2011. ^ Noyes, Katherine (May 2011). "Natty Narwhal: The First Linux for Newbies?". PC World. Retrieved 1 September 2011. ^ Noyes, Katherine (26 October 2010). "Is Unity the Right Interface for Desktop Ubuntu?". PC World. Archived from the original on 13 June 2011. Retrieved 28 October 2010. ^ "BionicBeaver/ReleaseNotes - Ubuntu Wiki". wiki.ubuntu.com. Retrieved 7 July 2018. ^ "yunit - A community-driven unity8 fork". ^ Shuttleworth, Mark. "Growing Ubuntu for cloud and IoT, rather than phone and convergence". ^ "CosmicCuttlefish/ReleaseNotes - Ubuntu Wiki". wiki.ubuntu.com. Retrieved 16 November 2018. ^ "Games / Native Free Ubuntu Games". Ubuntu Community Help Wiki. Canonical Ltd. 25 June 2011. Retrieved 2 May 2014. ^ "Apps/Games – GNOME Wiki!". Wiki.GNOME.org. The GNOME Project. 6 December 2013. Retrieved 2 May 2014. ^ "Ubuntu 17.04 review: Don't call it abandonware, per se". Ars Technica. Retrieved 24 December 2017. ^ "Licensing". ubuntu.com. Canonical Ltd. Retrieved 27 February 2016. ^ "Root Sudo". Ubuntu Wiki. Canonical Ltd. Retrieved 19 August 2008. ^ "Default Network Services". Ubuntu Wiki. Canonical Ltd.
^ "Gufw". Ubuntu Community Help Wiki. Canonical Ltd. Retrieved 4 February 2011. ^ "Compiler Flags". Ubuntu Wiki. Canonical Ltd. Retrieved 31 January 2011. ^ "Debian: Secure by Default". D-SbD.Alioth.Debian.org. Alioth Project. Retrieved 31 January 2011. ^ "FullDiskEncryptionHowto". Ubuntu Community Help Wiki. Canonical Ltd. Retrieved 13 June 2016. ^ "Encrypted Home". Ubuntu Community Help Wiki. Canonical Ltd. Retrieved 7 April 2015. ^ "Download Ubuntu Desktop". Ubuntu.com. Canonical Ltd. Retrieved 22 April 2016. ^ "How can I install and download drivers without internet?". Retrieved 8 September 2016. ^ "Ubuntu 11.10 will support ARM processors to take on Red Hat". The Inquirer. 10 October 2011. Retrieved 20 October 2011. ^ Paul, Ryan (26 April 2012). "Precise Pangolin rolls out: Ubuntu 12.04 released, introduces Unity HUD". Ars Technica. Retrieved 7 July 2012. ^ Larabel, Michael (23 January 2012). "Ubuntu's Already Making Plans For ARM in 2014, 2015". Phoronix.com. Retrieved 7 July 2012. ^ Vaughan-Nichols, Steven J. (22 August 2011). "Ubuntu Linux bets on the ARM server". ZDNet. Retrieved 20 October 2011. ^ "Ubuntu for IBM POWER8". Ubuntu.com. Canonical Ltd. Retrieved 7 October 2015. ^ Larabel, Michael (14 March 2012). "Ubuntu Plans to Drop Non-SMP PowerPC Support". Phoronix.com. Retrieved 7 July 2012. ^ "Technical Board Decision". Lists.Ubuntu.com. Canonical Ltd. February 2007. Retrieved 13 June 2008. ^ "Ubuntu 10.04 LTS (Lucid Lynx)". CDimage.Ubuntu.com. Canonical Ltd. Archived from the original on 10 July 2010. Retrieved 24 July 2010. ^ "Installing Ubuntu from the Live CD". Easy-Ubuntu-Linux.com. Integrity Enterprises. Archived from the original on 30 September 2008. Retrieved 19 August 2008. ^ a b "Releases.Ubuntu.com". Canonical Ltd. Retrieved 21 August 2012. ^ "Ubuntu 8.10 Persistent Flash Drive Installation". PenDriveLinux.com. Retrieved 5 September 2009. ^ "Casper, the Friendly (and Persistent) Ghost". Linux Journal. Retrieved 7 April 2015. ^ "casper – a hook for initramfs-tools to boot live systems". Manpages.Ubuntu.com. Canonical Ltd. Archived from the original on 28 March 2015. Retrieved 7 April 2015. ^ "Ubuntu 11.04 (Natty Narwhal) Alternate install CD". Releases.Ubuntu.com. Canonical Ltd. Retrieved 2 July 2011. ^ a b c "About Ubuntu: Licensing". Ubuntu.com. Canonical Ltd. Retrieved 26 July 2011. ^ "Kernel/Firmware - Ubuntu Wiki". wiki.ubuntu.com. Retrieved 1 June 2018. ^ "Ubuntu Backports". Ubuntu Community Help Wiki. Canonical Ltd. Retrieved 24 September 2010. ^ "Stable Release Updates". Ubuntu Wiki. Canonical Ltd. Retrieved 2 April 2009. ^ "SRU Verification". Ubuntu Wiki. Canonical Ltd. Retrieved 2 April 2009. ^ a b "Application packaging". Canonical.com. Canonical Ltd. Retrieved 15 August 2010. ^ "Application packaging". Canonical Ltd. Retrieved 15 August 2010. ^ Thomason, Brian. "Partner Repository Forum FAQ". Canonical Ltd. Retrieved 15 August 2010 – via Ubuntu Forums. ^ "Desktop support features". Canonical.com. Canonical Ltd. Archived from the original on 29 August 2010. Retrieved 15 August 2010. ^ "Repositories/Ubuntu: Adding Canonical Partner Repositories". Ubuntu Community Help Wiki. Canonical Ltd. Retrieved 27 February 2016. ^ "Packaging/PPA - Launchpad Help". help.launchpad.net. Retrieved 6 June 2017. ^ "Launchpad Blog". blog.launchpad.net. Retrieved 6 June 2017. ^ "Certification. Application packaging". Canonical.com. Canonical Ltd. Retrieved 21 August 2012. ^ "Ubuntu Software Center". Shop.Canonical.com. Canonical Ltd. Retrieved 27 May 2011. ^ Planella, David (December 2011). "Top 10 Ubuntu Software Centre app downloads for November". Developer.Ubuntu.com. Canonical Ltd. Archived from the original on 8 January 2012. Retrieved 29 December 2011. ^ Shuttleworth, Mark (18 October 2013). "Quantal, raring, saucy..." MarkShuttleworth.com. Retrieved 23 October 2013. ^ Shuttleworth, Mark (23 April 2014). "U talking to me?". MarkShuttleworth.com. Retrieved 23 April 2014. ^ "Utopic Unicorn Release Schedule". Ubuntu Wiki. Canonical Ltd. Retrieved 10 June 2014. ^ Shuttleworth, Mark (20 October 2014). "V is for Vivid". MarkShuttleworth.com. Retrieved 20 October 2014. ^ Shuttleworth, Mark (4 May 2015). "W is for Wily". MarkShuttleworth.com. Retrieved 6 May 2015. ^ "Wily Werewolf Release Schedule". Ubuntu Wiki. Canonical Ltd.
^ "Ubuntu 15.10 (Wily Werewolf) reaches End of Life on July 28 2016". lists.ubuntu.com. 7 July 2016. Retrieved 7 September 2016. ^ Shuttleworth, Mark (21 October 2015). "X marks the spot". MarkShuttleworth.com. Retrieved 22 October 2015. ^ "Canonical unveils 6th LTS release of Ubuntu with 16.04". Ubuntu Insights. Canonical Ltd. 20 April 2016. Retrieved 21 April 2016. ^ Shuttleworth, Mark (21 April 2016). "Y is for..." MarkShuttleworth.com. Retrieved 25 April 2016. ^ Sneddon, Joey-Elijah (27 April 2016). "This is the Release Date for Ubuntu 16.10 'Yakkety Yak'". OMG! Ubuntu!. Ohso Ltd. Retrieved 27 April 2016. ^ "Ubuntu 16.10 (Yakkety Yak) reaches End of Life on July 20 2017". lists.ubuntu.com. 4 July 2017. Retrieved 18 July 2017. ^ "Zesty Release Schedule". wiki.ubuntu.com. Retrieved 7 March 2017. ^ "Ubuntu 17.04 (Zesty Zapus) reaches End of Life on January 13, 2018". lists.ubuntu.com. Retrieved 13 January 2018. ^ "Artful Release Schedule". wiki.ubuntu.com. Retrieved 23 August 2017. ^ "Bionic Release Schedule". wiki.ubuntu.com. Retrieved 16 November 2018. ^ Shuttleworth, Mark. "Cue the Cosmic Cuttlefish". Retrieved 9 May 2018. ^ "Cosmic Release Schedule". wiki.ubuntu.com. 7 August 2018. Retrieved 7 August 2018. ^ "DiscoDingo Release Schedule". wiki.ubuntu.com. Retrieved 16 April 2019. ^ "Common Questions: Ubuntu Releases and Version Numbers". Ubuntu Community Help Wiki. Canonical Ltd. Retrieved 24 November 2010. ^ "Development Code Names". Ubuntu Wiki. Canonical Ltd. Retrieved 8 April 2011. ^ "Online Summit". UDS.Ubuntu.com. Canonical Ltd. 2014. Archived from the original on 13 June 2016. Retrieved 12 June 2016. ^ "Upgrade Notes: General Upgrade Information". Ubuntu Community Help Wiki. Canonical Ltd. Retrieved 26 October 2010. ^ Shuttleworth, Mark (2 April 2010). "Shooting for the Perfect 10.10 with Maverick Meerkat". MarkShuttleworth.com. Retrieved 8 June 2010. ^ Shuttleworth, Mark (11 May 2010). "ubuntu-marketing: 10.10.10". Ubuntu Mailing Lists. Canonical Ltd. Archived from the original on 23 August 2016. Retrieved 4 February 2011. ^ "Index of /releases/16.04.5". releases.ubuntu.com. Retrieved 7 August 2018. ^ "Index of /releases/14.04.5". releases.ubuntu.com. Retrieved 7 August 2018. ^ "Installation/MinimalCD". Canonical Ltd. Retrieved 20 April 2018. ^ "Download Ubuntu Desktop". Ubuntu.com. Canonical Ltd. Retrieved 15 May 2013. ^ Nestor, Marius. "Canonical to Make GNOME Default Session in Ubuntu 17.10, Likely Use Wayland". softpedia. Retrieved 22 April 2017. ^ Wallen, Jack. "Lightweight Linux Desktop Alternative: Xfce". Linux.com – The Source for Linux Information. Retrieved 7 April 2015. ^ "About Ubuntu Derivatives". Ubuntu. Retrieved 19 August 2012. ^ Sneddon, Joey (1 March 2015). "Ubuntu 15.04 Beta Available to Download, Ubuntu MATE Is Now An Official Flavor". OMG Ubuntu. Retrieved 1 March 2015. ^ a b "Preparing to Install". Ubuntu Official Documentation. Canonical Ltd. Retrieved 11 June 2013. ^ a b c "What's new in 16.04 LTS". Ubuntu.com. Canonical Ltd. 2016. Retrieved 13 June 2016. ^ Adam Conrad (21 April 2016). "Ubuntu 16.04 LTS (Xenial Xerus) released". lists.ubuntu.com. Retrieved 5 June 2017. ^ Larabel, Michael. "Taking ZFS for a Test Drive on Ubuntu 16.04 LTS". Phoronix.com. Retrieved 25 April 2016. ^ "zfs: ZFS on Linux - the official OpenZFS implementation for Linux". 6 June 2017. Retrieved 6 June 2017 – via GitHub. ^ "Ubuntu to announce its mobile Linux in June". ^ "Ubuntu Cloud Images". Cloud-images.Ubuntu.com. Canonical Ltd. 6 February 2014. Retrieved 6 February 2014. ^ "Where Do Droplets Form?". DigitalOcean Company Blog. DigitalOcean. 2 January 2014. Retrieved 6 February 2014. ^ "Canonical switches to OpenStack for Ubuntu Linux cloud". ZDNet. 10 May 2011. Retrieved 10 October 2011. ^ Prickett, Timothy (10 May 2011). "Ubuntu eats OpenStack for clouds". The Register. Retrieved 10 October 2011. ^ Kirkland, Dustin (7 June 2011). "Dustin Kirkland of Canonical" (Interview). Interviewed by Barton George. Cloud Expo, New York City: Dell Inc. Retrieved 13 January 2012 – via YouTube. ^ "ServerTeam: Orchestra". Ubuntu Wiki. Canonical Ltd. 4 January 2012. Retrieved 13 January 2012. ^ Kerner, Sean Michael (7 April 2010). "Ubuntu Claims 12 Million Users as Lucid Linux Desktop Nears". LinuxPlanet.com. Retrieved 7 April 2010. ^ "About Ubuntu Insights". Insights.Ubuntu.com. Canonical Ltd. Archived from the original on 6 September 2015. ^ "Usage statistics and market share of Linux for websites". W3Techs. Q-Success. September 2016. Retrieved 10 September 2016. ^ "Debian/Ubuntu extend the[ir] dominance in the Linux web server market at the expense of Red Hat/CentOS". W3Techs. Q-Success. 21 October 2013. Retrieved 10 September 2016. ^ "Usage statistics and market share of Ubuntu for websites". W3Techs. Q-Success. September 2016. Retrieved 10 September 2016. ^ "Web Technologies Statistics and Trends". W3Techs. Q-Success. Retrieved 11 September 2016. ^ "Usage statistics and market share of Unix for websites". W3Techs. Q-Success. September 2016. Retrieved 11 September 2016. ^ "EC2 Statistics". TheCloudMarket.com. Retrieved 10 September 2016. ^ Zachte, Eric (September 2013). "Wikimedia Traffic Analysis Report – Operating Systems". Wikimedia Statistics. Wikimedia Foundation. Retrieved 25 October 2013. ^ Relph-Knight, Terry (10 February 2012). "A tale of two distros: Ubuntu and Linux Mint". ZDNet. Retrieved 25 October 2013. ^ a b c Vance, Ashlee (10 January 2009). "A Software Populist Who Doesn't Do Windows". The New York Times. Retrieved 22 February 2009. ^ "Every Student in the Republic of Macedonia to Use Ubuntu-powered Computer Workstations". Canonical Ltd. 20 November 2007. Archived from the original on 3 April 2009. Retrieved 2 December 2010. ^ a b c d Paul, Ryan (11 March 2009). "French police: We saved millions of euros by adopting Ubuntu". Ars Technica. Retrieved 2 December 2010. ^ "India's Justice Sytem[sic] Switches to Ubuntu 10.04". News.Softpedia.com. SoftNews Net SRL. 18 October 2011. Retrieved 21 October 2011. ^ "Kerala Schools switches to Ubuntu 10.04". Insights.Ubuntu.com. Canonical Ltd. 17 February 2011. Retrieved 17 February 2011. ^ "Landeshauptstadt München – Das Projekt LiMux" [City of Munich – The Project LiMux]. Muenchen.de: Das offizielle Stadtportal (in German). Portal München Betriebs GmbH / Landeshauptstadt München / Stadtwerke München GmbH. Archived from the original on 4 September 2012. Retrieved 9 July 2012. ^ Essers, Loek (13 December 2013). "Munich open-source switch 'completed successfully'". Archived from the original on 13 October 2014. ^ iX. "Von Linux zurück zu Microsoft: Schwarz-Rot in München will LiMux rauswerfen". iX. Retrieved 6 June 2017. ^ Brown, Mark (23 March 2012). "Icelandic government makes a push for open-source software". Wired UK. Archived from the original on 9 July 2012. Retrieved 9 July 2012. ^ Gallagher, Sean (20 November 2012). "How Team Obama's tech efficiency left Romney IT in dust". Ars Technica. Retrieved 6 March 2018. Key in maximizing the value of the Obama campaign's IT spending was its use of open source tools and open architectures. Linux—particularly Ubuntu—was used as the server operating system of choice. ^ Stahie, Silviu (8 August 2014). "Turin to Be First Italian City to Adopt Ubuntu, Unshackle from the 'Tyranny of Proprietary Software'". News.Softpedia.com. SoftNews Net SRL. Retrieved 16 September 2014. ^ Guccione, Gabriele (4 August 2014). "Il Comune di Torino rinnova i pc e dà l'addio a Microsoft: "Risparmiamo 6 milioni"". la Repubblica. Gruppo Editoriale L′Espresso. Retrieved 16 September 2014. ^ Masters, John (June 2005). "LinuxWorld Expo UK 2005" (PDF). Linux Magazine. Linux New Media. Archived from the original (PDF) on 26 June 2008. Retrieved 19 June 2008. ^ Adelstein, Tom (19 April 2005). "Linux in Government: Linux Desktop Reviews, Part 6 – Ubuntu". Linux Journal. Retrieved 2 December 2010. ^ McAllister, Neil (January 2008). "Gutsy Gibbon: Desktop Linux OS Made Easy". PC World. 26: 84. ^ Venenzia, Paul (10 September 2007). "Best of open source in platforms and middleware". InfoWorld. Retrieved 2 December 2010. ^ Strohmeyer, Robert (2 June 2008). "Desktop Linux Face-Off: Ubuntu 8.04 vs. Fedora 9". PC World. Retrieved 19 August 2008. ^ Hartley, Matt; Byfield, Bruce (15 March 2016). "Best Linux Distro: Linux Experts Rate Distros". Datamation. Retrieved 17 April 2016. Obviously, Ubuntu was going to be at the top of the list.[...] Ubuntu has done more to put desktop Linux into the hands of the common man than any other distribution out there. ^ Hyneman, Jamie (18 February 2008). "MythBusters: 7 Tech Headaches—and How to Fix Them". Popular Mechanics. Archived from the original on 24 March 2010. Retrieved 2 December 2010. ^ Thomas, K.; Channelle, A.; Sicam, J. (2009). Beginning Ubuntu Linux. Apress. p. xxxii. ISBN 978-1-4302-1999-6. ^ Sneddon, Joey. "Stephen Fry: 'I Use Ubuntu'". OMG! Ubuntu!. Ohso Ltd. Retrieved 29 August 2012. ^ Hillenius, Gijs (20 January 2014). "Ubuntu 'highest score' in UK gov security test". JoinUp from the European Commission. Retrieved 2 February 2014. ^ a b Gilbertson, Scott (23 April 2014). "Ubuntu 14.04 review: Missing the boat on big changes". Ars Technica. Retrieved 25 April 2014. ^ Lynch, Jim (5 December 2012). "Ubuntu 12.10". Linux Desktop Reviews. Archived from the original on 10 December 2012. Retrieved 6 December 2012. ^ Brodkin, J. (2012). "Richard Stallman calls Ubuntu 'spyware' because it tracks searches". Ars Technica. ^ a b c Lee, Micah (29 October 2012). "Privacy in Ubuntu 12.10: Amazon Ads and Data Leaks". Deeplinks Blog. Electronic Frontier Foundation. Retrieved 29 October 2013. ^ a b Gilbertson, Scott (18 October 2012). "Ay caramba, Ubuntu 12.10: Get it right on Amazon!". The Register. Retrieved 29 October 2013. ^ Samson, Ted (25 September 2012). "Canonical wants to shill for Amazon on Ubuntu users' desktops". InfoWorld. Retrieved 30 October 2013. ^ "Shuttleworth defends Ubuntu Linux integrating Amazon". ZDNet. 23 September 2012. Retrieved 29 October 2013. ^ Brodkin, J. (2013). "'Fix Ubuntu' site accused of trademark violation, asked to change domain name". Ars Technica. ^ "Körberlgeld mit lokaler Suche: Marc Shuttleworth, Ubuntu" [Profiting from Local Search: Marc Shuttleworth, Ubuntu]. BigBrotherAwards.at. Iuridicum Remedium (IuRe.org). 2013. ^ Gilbertson, Scott (10 May 2016). "Ubuntu 16.04 proves even an LTS release can live at Linux's bleeding edge". Ars Technica. ^ "Ubuntu 17.10: Return of the GNOME | Ars Technica". Retrieved 22 December 2017. ^ "Ubuntu's Shopping Lens Might Be Illegal in Europe". Sofpedia.com. 9 October 2012. Retrieved 24 February 2016. ^ "Blogger Claims Ubuntu's New Shopping Lens Breaks EU Law". OMG! Ubuntu!. Ohso Ltd. 10 October 2012. Retrieved 24 February 2016. ^ de Sousa, Luís (9 December 2012). "Petition for a Better Ubuntu". AtTheEdgeOfTime.Blogspot.com. Retrieved 24 February 2016. ^ de Sousa, Luís (6 August 2014). "Ubuntu Shopping Lens deemed legal by UK data privacy office". AtTheEdgeOfTime.Blogspot.com. Retrieved 24 February 2016. ^ "Ubuntu Local Community Teams". Ubuntu Wiki. Canonical Ltd.
^ "Ubuntu LoCo Team Portal". Ubuntu.com. Canonical Ltd. Retrieved 9 November 2015. ^ "About Local Community (LoCo) Teams". LoCo.Ubuntu.com. Canonical Ltd. Retrieved 9 November 2015. ^ "XPS 13 Developer Edition". Dell.com. Dell Inc. Retrieved 25 August 2014. ^ "Dell and Ubuntu". Canonical Ltd. Retrieved 21 August 2012. ^ Hilzinger, Marcel. "Günstiges Netbook aus China". LinuxCommunity. Retrieved 7 April 2015. ^ "Sharp NetWalker PC-Z1: What you get when you shrink a netbook". Liliputing.com. Retrieved 26 March 2010. ^ "Tiny PCs can be beautiful, the Cirrus7 Nimbini is one of those PCs". Geek.com. Retrieved 14 January 2016. ^ "Cirrus7 Nimbini – The Most Stylish Ubuntu PC Ever Made?". OMG! Ubuntu!. Ohso Ltd. Retrieved 14 January 2016. ^ "XPS 13 Laptop, Developer Edition". Dell.com. Dell Inc.
^ Canonical. "Ubuntu Desktop certified hardware | Ubuntu". certification.ubuntu.com. Retrieved 31 May 2018. ^ "Bonobo WS". system76.com. Retrieved 31 May 2018. ^ "System76 announces servers with Ubuntu 7.10 and Canonical support services". Ubuntu.com. Canonical Ltd. Archived from the original on 1 March 2008. Retrieved 5 March 2008. ^ "Dell Upgrades Consumer Linux PCs to Ubuntu 8.04". YourBlog.Dell.com. Dell Inc. Archived from the original on 2 August 2008. Retrieved 13 September 2008. ^ "Asus will preload Ubuntu Linux on three Eee PCs". The Inquirer. 2 June 2011. Retrieved 15 June 2011. ^ Woods, Ben (3 June 2011). "Asus preloads Eee PC models with Ubuntu". ZDNet UK. CBS Interactive. Archived from the original on 6 June 2011. Retrieved 15 June 2011. ^ Parrish, Kevin (3 June 2011). "Asus Launching Eee PC Netbooks with Ubuntu". TomsHardware.com. Retrieved 15 June 2011. ^ O'Brien, Terrence (19 October 2011). "Vodafone brings ARM and Ubuntu together for South African Webbook". Engadget. AOL. Retrieved 20 October 2011. ^ Sneddon, Joey-Elijah (18 October 2011). "The Ubuntu Powered 'Vodafone Webbook' Launched". OMG! Ubuntu!. Ohso Ltd. Retrieved 20 October 2011. ^ Nestor, Marius (21 October 2011). "Ubuntu 11.10 Powered Webbook Sells at $190". News.Softpedia.com. SoftNews Net SRL. Retrieved 21 October 2011. ^ "Dell launch with Ubuntu at retail in India" (Press release). Canonical Ltd. 18 June 2012. Archived from the original on 21 June 2012. Retrieved 18 June 2012. ^ Murphy, Mark (18 June 2012). "Dell Extends Ubuntu Retail into India". Blog.Canonical.com. Canonical Ltd. Retrieved 18 June 2012. ^ "Alienware X51 gaming PC now available with Ubuntu, starts at $600". Engadget. AOL. 5 April 2013. Retrieved 17 August 2013. ^ Merriman, Chris (17 August 2015). "IBM makes 'biggest code drop' as Canonical and Suse tie-up brings better Linux to mainframes: UbuntuOne brings industry standard tools to a mainframe environment". ^ "Intel Compute Stick Product Brief" (PDF). Intel.com. Intel. Archived from the original (PDF) on 8 January 2016. Retrieved 25 September 2015. ^ Vaughan-Nichols, Steven J. (29 March 2016). "Microsoft and Canonical partner to bring Ubuntu to Windows 10". ZDNet. Retrieved 8 June 2016. ^ Hammons, Jack (3 March 2017). "Bash on Ubuntu on Windows". MSDN. ^ Kirkland, Dustin (30 March 2016). "Ubuntu on Windows – The Ubuntu Userspace for Windows Developers". Ubuntu Insights. Canonical Ltd. Retrieved 12 June 2016. ^ Vaughan-Nichols, Steven J. (15 October 2017). "Windows Subsystem for Linux graduates in Windows 10 Fall Creators Update". ZDNet. Retrieved 13 February 2018.